The summer months are a prime time to vacation with family and friends, whether it’s a trip to the beach, a camping excursion, or a getaway to the lake. If your pets are like family, which most pups are, you’ll want to bring them along for the adventure! Organizing, planning, and packing for a vacation is hard enough, you shouldn’t have to stress about the needs of your pets. We’ve made it easier for you with our list of do’s and don’ts of traveling with a pet, along with a list of products for you and your pet’s active lifestyle while on vacay! Do contact your pet’s veterinarian before your trip! It’s important to consult with your pet’s vet before embarking on your trip, especially if your friend has never taken a long road trip before. Your vet may want to address any health concerns they have for your pet before you both leave for vacay. Don’t surprise your pet with a spontaneous trip! Make sure to prepare your pet for the trip by taking them on different series of short drives while gradually lengthening the time spent in the car. Doing this while leading up to the trip will allow your pet to not be caught off guard when they’re put into a car for hours at a time. Practice always makes perfect, this will help your pup be ready to go when it comes time for the road trip! Always, always make sure your pet is wearing their collar with their proper id tag at all times! Making sure the address, phone numbers, and current vaccination tags are all up to date is very important when traveling with your furry friend! This prevents you and your pet from being separated from each other on your trip! Don’t allow your pet to sit shotgun in the passenger seat! Place your pet in the backseat of your vehicle in either a crate, harness, or other restraining device (Products from Premium Pets that can be used for this discussed down below!) Make sure your pet is used to the crate or harness before embarking on your trip! Do make plenty of pit stops to let your pup out to potty! It’s important to stop every 2-3 hours to let your furry friend out to potty and to get some light exercise! Never, ever leave your pup in a hot car by themselves! On a summer day where the temperature outside is 80 degrees, the inside of a car can reach up to 90 degrees, which can cause your pet to go into heat stroke within just 15 minutes! Don’t let this happen to your furry friend! Although this might be your vacay, you decided to bring your pup along, so it’s their vacay too! Make sure they have activities to do and are entertained. If you’re going out for a boat ride on the lake, bring along your pup (As long as they have a life jacket, different brands discussed below!). Take your furry friend on a walk throughout the campground, they’ll love seeing all the different sights and smelling all the smells they possibly can. Don’t get frustrated with your pet! This whole experience isn’t just new to you, it’s new to your pet too! Don’t get angry with them if they get anxious or don’t understand what you’re trying to say, be patient and considerate of them! Packing for yourself is hard enough, we’ve made it easier and put together a list of items that you should include in your pup’s travel bag! Your pet’s favorite toys or blanket - this gives your pet a sense of comfort and familiarity! Don’t leave your pet unattended in an unfamiliar place! Never leave your furry friend alone somewhere that they are not used to. This will cause them to become nervous and anxious, with the possibility of them trying to escape and run away to find you. You’re their best friend, they always want to be next to you, always make them feel comfortable and safe! We put together a list of a few products available in the store that are perfect for you and your adventurous pupper! 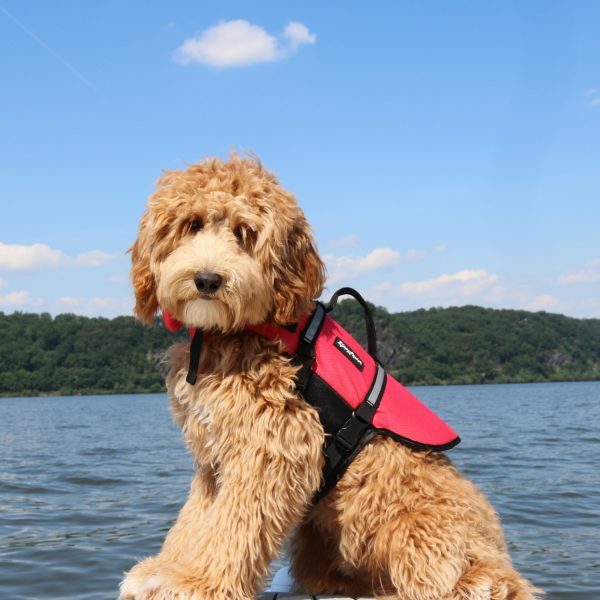 Zippy Paws has a few of our favorite products that would be a great asset to any outdoor vacation, like their Adventure Life Jacket or Portable Treat Bags & Water Bowls. In store, another perfect brand for outdoor activities is Kurgo, which has car harnesses that are perfect for any size pupper. Kurgo also has several car seat covers and hammock style covers to protect your car that are waterproof, stain resistant and machine washable making it easy to clean when you get home. For older dogs and injured dogs that need assistance, try Kurgo's dog lifter, perfect for getting into the car. Don’t forget, we have plenty of different types of leashes, like our Nitey Leashes, harnesses, toys, food, waste bags and treats that would all be a great addition to your pet’s traveling bag. If your dog is one to get nervous or sick on car rides, try our calming supplements, CBD oil, or Happy Travelers formula. These options are useful for separation anxiety, travel anxiety, to socialize a nervous or excitable pet into a new environment, during thunderstorms, fireworks, airline travel, visits to groomers, vets, and kennels. Another great product is our Insect Shield Breathable Mesh Tanks. With built-in insect protection, your pup will be protected from mosquitoes, ticks, flies and fleas, all in a lightweight fabric for a comfortable fit. Travel safe and have a good rest of your summer with your furry friends! !